“Underground” is dressed to be epic, with a set of soul royalty for its backing singers: Luther Vandross, Chaka Khan, Cissy Houston, Fonzi Thornton (Chic, plus Roxy Music’s Avalon), Eunice Peterson (a great R&B session singer, working with Aretha Franklin, among others), Renelle Stafford (another legend—she’s on Paul Simon’s “Mother and Child Reunion”) and members of the Radio Choir of the New Hope Baptist Church. And its lead guitarist is the master bluesman Albert Collins. Unfortunately, the song’s not good enough to justify their presence, and the guest players fail to transport it anywhere. It doesn’t help that Arif Mardin often drowns them in the mix. Nor was the song good enough for the public, as it turned out: “Underground” completely flopped in the US, not even cracking the Billboard 100, and had a mediocre charting in the UK. Bowie has never performed it on stage, and his only promotional effort for it was Steve Barron’s elaborate video, with puppets, animation sequences (budgets for these apparently shot up after a-Ha’s “Take On Me”) and a Doctor Who regeneration style-montage of past Bowie incarnations. There’s no great mystery why “Underground” failed: it’s a draggy, overproduced song that squanders its resources. Take how long it takes to get to the big payoff—the call-and-response refrain—and then, after finally unveiling the chorus, Bowie trudges all the way back to the start and repeats the entire song again: a sax solo, another verse, another pre-chorus, another bridge. It’s almost two minutes before we get back to the refrain. And even the chorus (which kicks off with a key change to C major, from the original G)—which finds Bowie in good, rough voice (“DADDY DADDY get me OUTTA HERE!”) and Richard Tee enlivening things with romping juke-joint piano—isn’t as electrifying as it wants to be. Something feels missing. Again, some of it’s due to the production—the “choir” chorus, a set of fantastic pro singers, is often a faceless blob, placed low and back in the mix, hanging like a leaden cloud. So when Bowie’s parrying against the chorus and rallying them, their responses seem off, distant, detached. Compare the wild, luxurious warmth of Vandross and Robin Clark’s singing on “Young Americans,” the way that they buffet and sway Bowie, how they make him fight to keep command of the song. There’s none of that drama in “Underground,” there’s no dialogue. Only at the end of the coda, when a few of the female singers start jazzing up the melody (“wanna live UN-DER-GROUND! !“) is there finally a spark, and it’s quickly snuffed out by the fadeout. Bowie’s foray into gospel pop wasn’t just an attempt at reviving the Young Americans magic—the sound was trendy in the mid-Eighties, with choirs carted in for show-stoppers like Foreigner’s “I Want to Know What Love Is” or the Rattle and Hum version of “I Still Haven’t Found What I’m Looking For.” For those tracks, the choir was the loud, warm community that welcomes the solitary, questing singer and bears him up. So give Bowie some credit: his gospel choir instead gleefully sings about a delusory world, one that well could be a purgatory or hell. The choir blindly supports the singer in his actions, though he doesn’t know what he wants himself: they’re blissful enablers. He’s tempted to disappear into a world of imagination, or could even be contemplating suicide, and he’s lost and bewildered—hence his occasional screams for help (dutifully repeated by the choir). 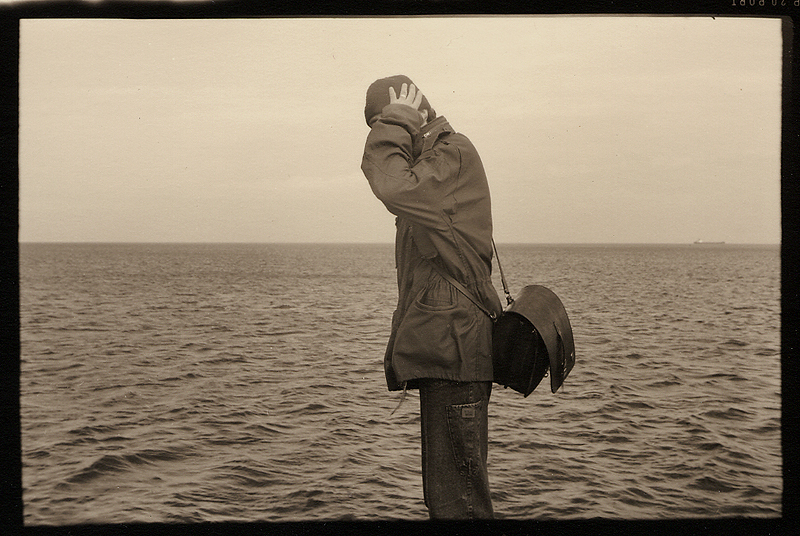 But is he asking to get out of the world, or is he already trapped in his illusions? So while “Underground” is fine for a singalong end titles theme, what a great squandered opportunity. This is the return of Luther Vandross, now an R&B superstar, into Bowie’s orbit? This is the only time Chaka Khan ever appears on a Bowie record? This is how you use the Iceman—confine him low in one channel, have him noodle over half a verse against a wall of synthesizers, then give him a solo in the coda where he spends his time fighting to be heard? It’s bizarre that Bowie/Mardin assembled all of these icons but made the principal players in the final mix the session keyboardist Robbie Buchanan, the drum programming of Steve Ferrone and Bob Gay on generic saxophone. I’m surprised they didn’t hire Miles Davis and then swap out most of his trumpet lines for Fairlight dubs. Recorded ca. 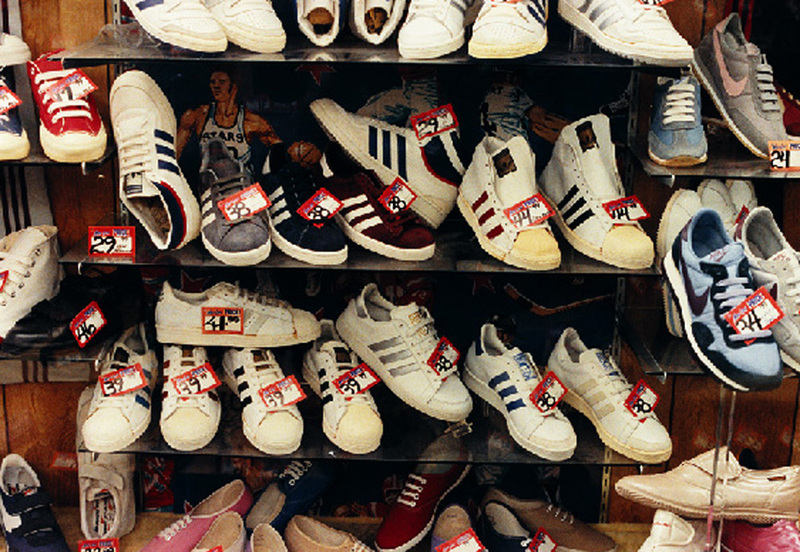 late 1985. 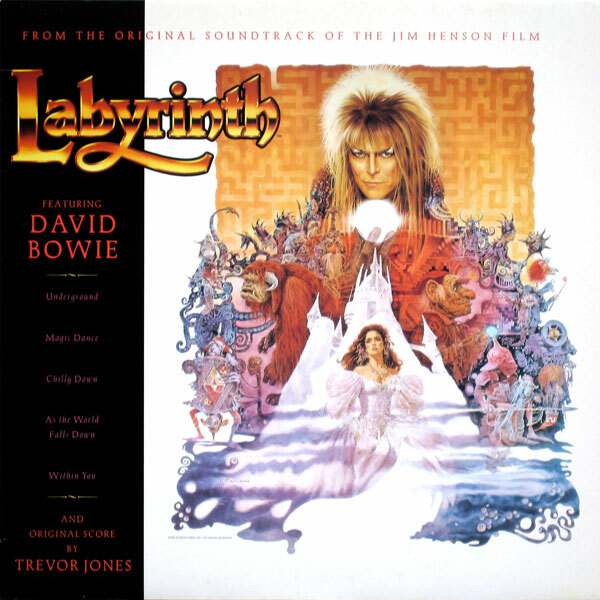 For Labyrinth, there were two takes of “Underground” used—a slower-tempo choir-free cut for the opening credits, with the song married to Trevor Jones’ score (which sounds like incidental music for a lesser hour of the Olympic Games telecast), and the six-minute uptempo “master” version for the end titles. An edit of the latter was issued as a single on 23 June 1986 (EMI America 216, #21 UK); there was also an eight-minute dance mix, which is far and away the best use of the choir. Three years later, another song would marry a gospel choir chorus to synth basslines and ricocheting beats, and who knows, its author was possibly influenced by “Underground.” But she did it with a bit more style. Labyrinth‘s climactic song is a brief piece of psychotic recitative with an unstable time signature (it’s shifting between 3/4, 4/4 and 6/4, though much of the first half is in free time); it lacks a melody and its refrain, if there is one, is a wailing three-line expiration. Who knows what Jim Henson made of “Within You” when he heard it, but he gamely built a sequence around it. The scene: Sarah (Jennifer Connelly) finally reaches the heart of the Labyrinth, where she discovers an M.C. Escher-inspired three-dimensional set of stairwells. Sarah, like many bright teenagers in the Eighties, has Escher’s Relativity poster on her wall—it’s another clue that the entire Labyrinth world has been assembled out of her mind. Bowie confronts her—only now he’s apparently a hologram able to walk on walls—and she defeats his stratagem by choosing to sacrifice herself (or her potential adulthood) to save her brother. But the histrionic “Within You” doesn’t really work here. 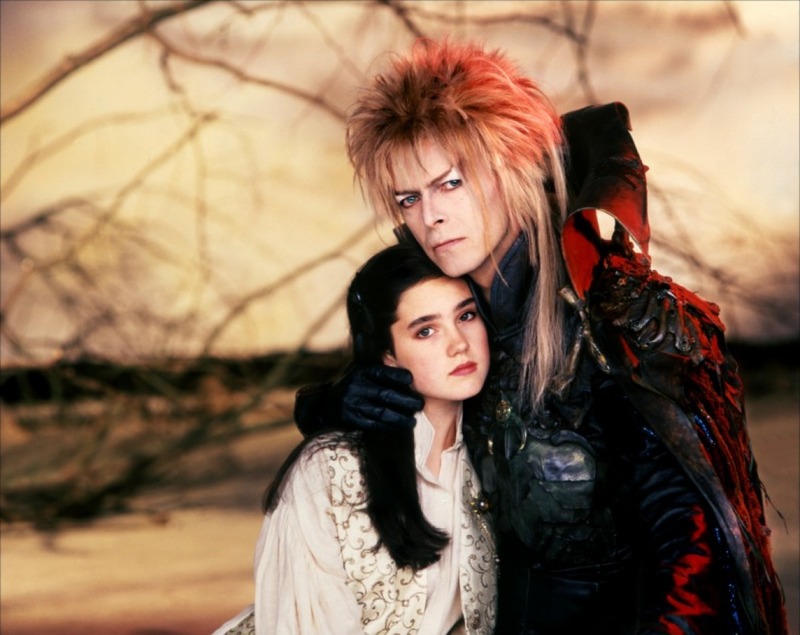 The problem (as commenter Pinstripe Hourglass noted on “As the World Falls Down”) is that Labyrinth has consistently retreated into pretending it’s only a girl’s adventure story whenever it’s encountered signs of adolescent turmoil, so that Sarah and Jareth’s connection is based on a single scene, the ballroom hallucination sequence. Having Jareth act like a catastrophically devastated lover here seems off base. You could argue that he’s offering a variant of the alluring sexual fantasy of the “World Falls Down” scene, with Sarah here shown the operatic emotions of an imagined adulthood, the potential to be heartbroken so much that you can’t breathe. That said, Sarah spends most the sequence running up and down stairs to fetch her brother, as if she’s playing the last level of Dragon’s Lair. “Within You” begins an octave-spanning bass-synth motif that Bowie’s opening phrases parallel, then there’s a quartet of higher-pitched, more desperate lines (e.g., “your EYES can be so CRUEL”, with Bowie peaking on a high G for each line) that lead to a collapse: the quasi-refrain that expires with the four-bar “I—I can’t live within you.” The portentous vocal and the chimes-of-doom synthesizers suggest that Bowie’s slightly mocking the high dramatics of his Berlin records—it’s like “Warszawa” reworked by a heartsick Goth. Even by that standard, the arrangement is overkill, with four keyboardists (Brian Gascoigne , David Lawson, Robbie Buchanan and Simon Lloyd) apparently in a contest to see who could go most over the top—maybe Arif Mardin was offering a prize at the end of the session. The laurel should’ve gone to whoever did the synth arpeggios. Recorded: ca. July-September 1985, London. On the Labyrinth OST. In the summer of 1986, EMI’s vice president of A&R, Neil Portnow, spoke at an industry panel about the soundtrack album boom. Footloose, Flashdance, Beverly Hills Cop, Top Gun—all had churned out #1 hits and had dominated the album charts. Portnow said it signaled a shift, that films and videos were replacing radio as the way people heard new music. But the strategy had its downsides—too many films, too many soundtracks, and an artist risked overexposure, becoming a parody of himself. At the time, this was the end for many old fans. Already alienated by global populist Bowie and disappointed by his latest album, the old ravers and New Romantics now met Bowie’s latest incarnation: a dancing master Goblin King who looked like he was going to do an ice-skating routine later in the picture. So Bowie had fully lost the plot. 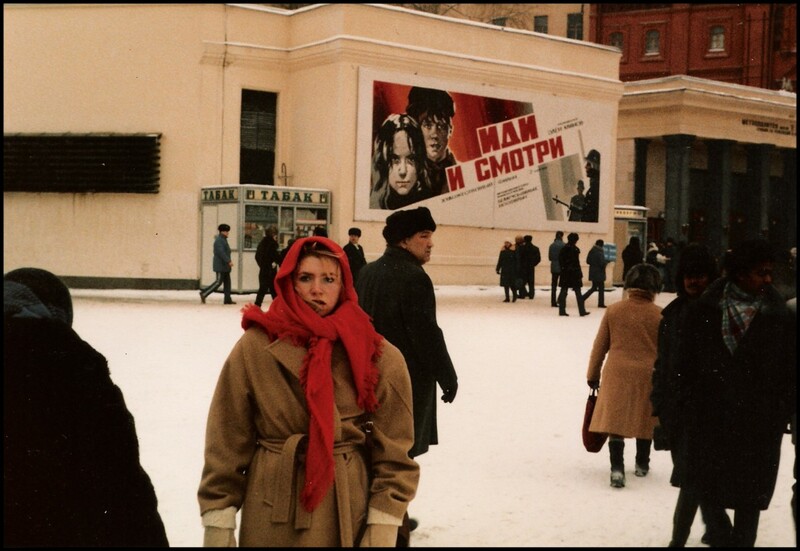 And Portnow’s public grousing showed that EMI was also bewildered by what their marquee artist was doing. Where was the next record? What was this Dark Fraggle Rock nonsense? Of course, this ignored the fact that Bowie was winning a new generation of fans by starring in Labyrinth, and that he was having a blast doing it, briefly free from the burden of following himself up. The ridicule “Magic Dance” got (and still gets) reminds me of the knocks that “Laughing Gnome” took (and still takes). They’re both goofy songs designed for kids, they’re both pure products of their time (the woodwind-heavy “Gnome” is pure 1967, while “Magic Dance” is like an aural time capsule of a synthesizer-saturated 1985) and both have far more going on than at first appears. And the song itself, apart from the line about the goblin babe, has nothing to do with Labyrinth at all –it’s just Bowie playing on the classic rock & roll theme of using black magic for love (“Love Potion No. 9”, “Fortune Teller,” “I Put a Spell on You”). The singer’s girl is depressed or just doesn’t care for him anymore, so he runs through all the magic spells he wants to use to get her back. But as the chorus notes, all she wants to do is dance. “Magic Dance” has one of Bowie’s strongest vocal melodies of the period, too, with the verse a run of delayed satisfactions until, midway through, there’s a slow, steady move up an octave, climaxing in Bowie’s “Bay-bee BLUE…NO-BO-DY KNEW”! It’s the most alive he’s sounded in years. Or the crafty call-and-response in the chorus, in which the backing singers take the lead, while Bowie waits until the third beat of each bar to counter them. And the chorus’ closing line, “slap that baby—make him free!” continues the song’s mix of whimsy and wisdom—it’s a silly line, meant to be howled by goblin puppets, sure, but it’s also incisive. Because when would you slap a baby? To make it breathe just after it’s born. In a film that’s one long metaphor about leaving childhood behind, the line suggests that once a child comes into the world and is slapped into life, she’s already free from her mother; she’s starting off on a long journey of her own. Problem is, “Magic Dance” worked fine as a three-minute scene in the film. For the official soundtrack recording, however, it was extended to over five minutes (there was even a seven-minute dance mix): after the upteenth repeat of the chorus, it starts to really drag. The extended mix is most notable for Dan Huff’s flashy eight-bar guitar solo. Hats off to him. Mick Ronson got “Width of a Circle,” Alan Parker got “Rebel Rebel,” Earl Slick got “Station to Station,” Robert Fripp got “Heroes.” Huff, drawing a pair of deuces, got “Magic Dance.” He does what he can. For the studio version of “Dance,” Diva Gray, Fonzi Thornton and the bassist Will Lee were the backing singers, though Bowie (a la “Gnome”) did much of the voice work himself, including the baby gurgles: they had wanted to use Gray’s child, but the baby would keep quiet whenever the mike was on. Recorded ca. July-September 1985, London. Released on the Labyrinth OST in June 1986. An extended dance mix was issued as a single in the US in January 1987 (EMI America 19217), but it went nowhere. * Portnow has done well for himself—he’s currently head of NARAS and gives an address at the Grammys every year. His quotes are from the 2 August 1986 issue of Billboard. ** An endnote on the infamous pants. I saw Labyrinth when it came out in ’86, when I was 14, and all I took from it was a few odd jokes, a few nightmarish images (esp. the “helping hands”) and a honking crush on Ms. Connelly. The idea that there was anything prominent about Bowie’s outfit completely escaped me at the time. 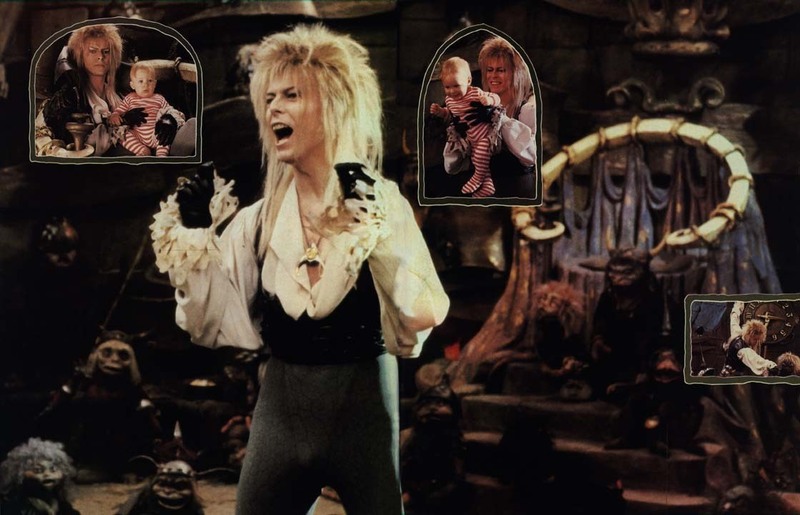 But throughout the past two decades, whenever Labyrinth has come up in conversation, the issue of Bowie’s pants is always raised. Apparently an entire generation now credits Bowie’s pants with kick-starting puberty, to the point where Bowie’s pants have become a cliche, a pop-cultural touchstone. There is a Facebook group dedicated to it, it’s a common Tumblr tag and a popular drinking game. 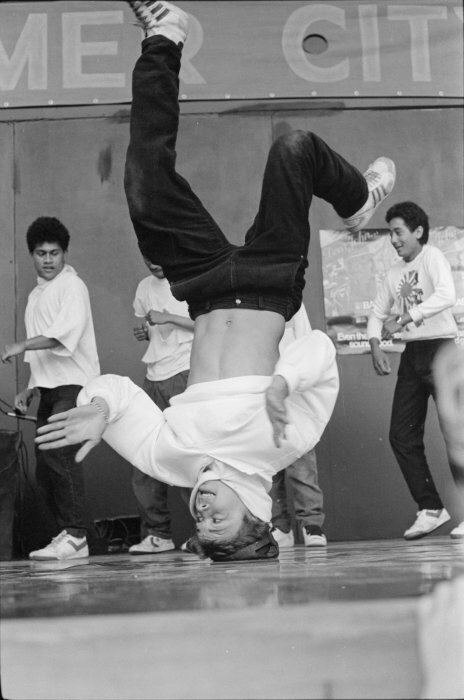 Top: “Jason Bell breakdancing in The Dell, Wellington [NZ], during Summer City, 4 January 1985.” Dominion Post staff photographer (Reference number: EP/1985/0078/8A-F). The Dominion Post Collection, Photographic Archive, Alexander Turnbull Library.